Native Foods Westwood you try a little harder? Papered-over front window in Westwood. Wait, I should clarify. I love their food. And the people who work in their stores. And the fact that they’ve caught on with a non-vegan and non-vegetarian crowd and are showing people that vegan food can not only taste good but great. Now the part I don’t love: this company has perhaps the worst customer service I have ever encountered from a business. Not at the stores. There the people are, for the most part, super friendly and helpful. But have you ever tried to email them a question or concern? Quite possibly you just answered yes. Did you ever get a response to your email? Quite likely you just answered no. What is with a company that puts an email address for customer service questions on their website and then doesn’t reply? Bizarre. One manager told me that the company is only willing to pay one person to handle all the emails and that it’s too much for one person. Another manager at a different store told me the owner is very controlling and all emails are routed straight to him. Who knows? All I know is that the second I mentioned the word “email” to both of these managers their eyes rolled up in a way that let me know they’re well aware of the company’s huge customer service problem and have to listen to complaints about it from customers all day long. They both told me the same thing, which was basically: If you ever have a problem at a Native Foods please don’t try to email just come into the store and ask for a manager and we’ll try to make it right for you. Good advice. So yesterday, wanting a Chicago Dip sandwich because I fear it might be gone come next week when I believe the new menu is set to debut, I drove over to Westwood Village. I then did the mandatory 15 minutes of circling before finding a spot. But hey, it’s worth it, because I love that sandwich! I get out of my car, put my coins in the meter, and then start walking down the block. Step + anticipation, step + anticipation, step + anticipation. I’m almost there. Step + salivating anticipation. I’m there! I put my hand on the door handle and pull. The door does not move. It’s 6pm. I look around. My brain tells me to admit it to myself: they are closed. Now a normal business would have a sign up on the door or window telling you why they’re closed during normal business hours, right? 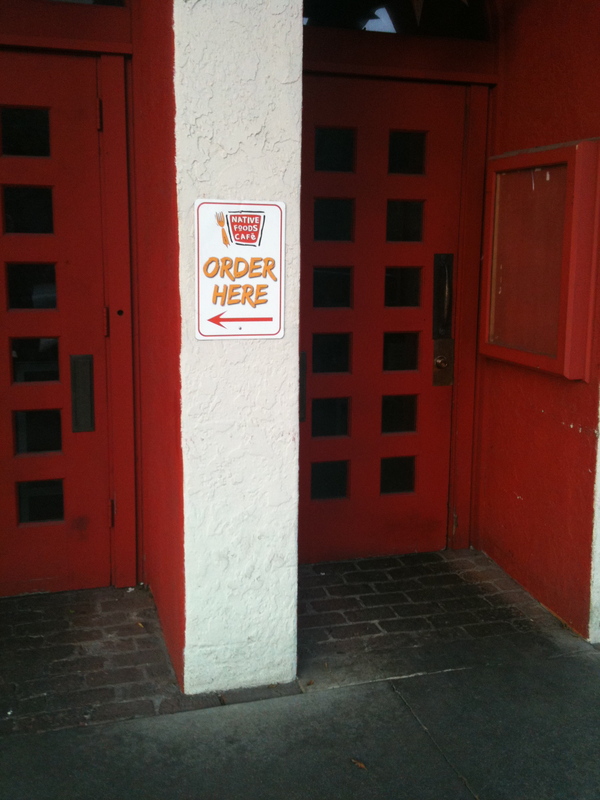 Especially a business that has a signholder attached to the wall right next to its front door. But that’s empty. Empty as in, someone took the time to remove the large menu that’s usually in said signholder but did not replace it with a sign of explanation. This is a bad sign. Note the empty signholder to the right. The lack of a sign is not a good sign. While I’m standing out front, for about two minutes, six — that’s right — six separate parties come by, try the door, look at each other surprised, look at me, exchange shrugs, and walk off. Now if you patronize that location, you know they’ve been going through some changes. They’ve been renovating the space next door to become their new restaurant, and during this renovation they’ve stayed open, but have forced any diners wanting to eat there to consume their meal straight from a cardboard box. You can’t imagine how awkward and unpleasant it is to eat a hot meal from a cardboard box until you try it. It basically interferes with every biological pleasure receptor designed to make you enjoy a meal. With most companies I’d assume they’re forced to do it this way because of some arcane zoning rule or something. But with Native Foods you never know. Might just be a clueless owner or something. The last time I ate there — a couple of weeks ago — it looked like renovations for the new location were getting toward done. I was psyched. But mind you, still no signs up announcing an opening date, and of course nothing letting you know they’re going to shut down the existing restaurant for a period of time before the new one next door opens. Yesterday I peeked through a hole in the plastic sheeting covering the inside of the window and it looks really close to done. Signs are up and everything. I even took a photo. It looks nice. With an upstairs dining area and all. Can’t wait. Really. So when I got home I checked their Twitter to see if there was any information on the Westwood location closing or opening. You know, because any normal company with a Twitter would use it for exactly that purpose. To let their customers know what’s going on. I searched back a month. Nothing. Then I went to their website’s blog. Again, searched back a month. Nothing. Perfect! Because that’s exactly where customers who have been to that store a hundred times would look for information for that store: at the place that tells them where the place they’ve been to a hundred times is located. Native Foods owner: you’ve got lightning in your hands. Your chain is expanding, thriving. Loosen the reins a little bit. Delegate more. Hire additional people to help you out. Do whatever you need to do in order to keep your customer service problems from cutting against the good will generated by your food and your staffers. Because most people only put up with bad customer service for so long before they go elsewhere. And these days, there are a lot more elsewheres opening up. 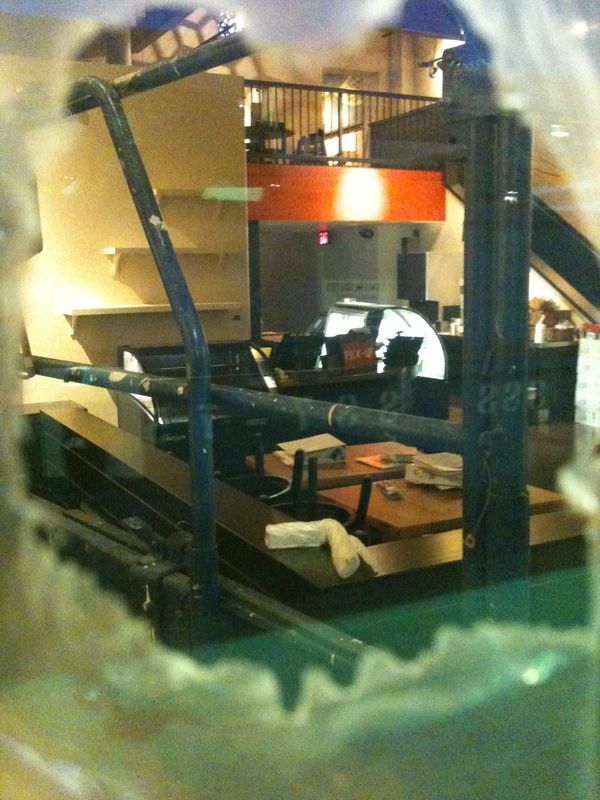 ← Native Foods Cafe: Preview or trainee view? How frustrating! I think it might be worth a shot letting Chef Tanya know. If you don’t already follow her on Twitter, her handle is @cheftanyatweets. 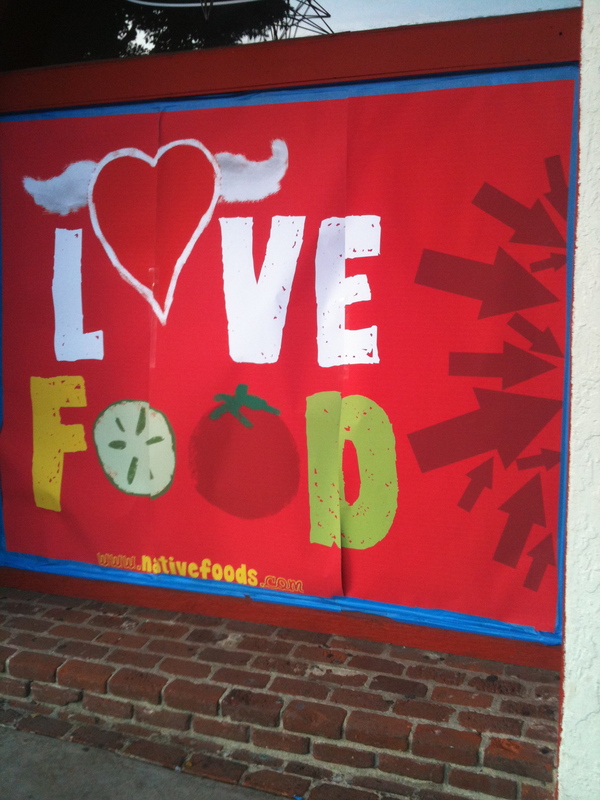 But did you know that Native Foods was actually purchased 3 years ago? See below. I don’t believe this was something they actively promoted, which I thought was a bit odd, and this I think only came to light with their expansion to the Chicago area, which is where they’re headquartered now. So yes they are expanding, which is great, but all the more reason to spend money to have awesome customer service. I was aware of the sale but I thought until recently that she was remaining involved. But then a few weeks ago I got a Twitter DM from Chef Tanya telling me she was changing her Twitter from @cheftanyanative to @cheftanyatweets — I imagine this went to all of her followers. Around the same time I saw the Native Foods website start doing a lot of talking about Chef Kendall Huff, so the combination of those two things made me think that maybe Chef Tanya was no longer associated with Native Foods in any ownership or legal capacity. That’s just a guess but if you look at @cheftanyatweets she hasn’t mentioned Native Foods since early December so it makes me think I might be right. Native Foods also closed the Palm Desert location which was one of Chef Tanya’s earliest and is remodeling the original one in Palm Springs, including the elimination of waiter service, I’ve heard. I love their food and think it’s great that they’re able to grow so fast, but there’s constant chatter about how the new owners have no previous restaurant experience and are too controlling and about how things are mismanaged from the top down. It is truly astounding how high the error rate is at their Culver City location. I know it’s their highest grossing store but seriously, then staff up to meet the demand — isn’t that the problem every business wants to have? Instead it feels like nobody is trained, and nobody cares, and either the wrong things go into your bag or onto your tray, or that one of the things you ordered turns out to be missing when you get home. This seems to happen to me easily more than half the time. That’s why I started going only to the Westwood location, because I can’t remember them ever making a mistake or not being friendly or not seeming like they know exactly what they’re doing. The person who manages the Westwood location does a terrific job, and in a difficult situation what with the construction at all, whereas the Culver City spot seems to have at least four or five managers, two of whom couldn’t be friendlier and wanting to help, and three of whom seem like they hate their job and their customers and act as if dealing with mundane problems like order errors are beneath them. The only thing all of the managers at all the locations I’ve been to can seem to agree on is that they’ve never worked anywhere before where the top management is so good at opening new locations and growing the business yet so bad at knowing how to manage the day to day functioning of the individual locations. But I’m rooting for the top management to get a hold of things, either by taking a breather from the rapid growth until they get their daily operations to run more smoothly, or by bringing in more people and letting them do what they’re hired to do. I wouldn’t say something like this in a public forum if I hadn’t heard almost exactly the same story from so many different managers, and like I said, I’m a big fan of theirs, I’m rooting for them, so I hope they take it as a constructive critique if they ever wind up reading this. I couldn’t agree more! Where is Chef Tanya????? She is the reason Native Foods taste so good. Something doesn’t seem right.